I needed some comfort food with attitude (and no trips to the grocery store). Some of you will remember in the early days of this blog that Leandro and I were in the emergency room twice within a month’s time to get him stitched up. That stress is in the past, but the part about having to pay the equivalent of an entire paycheck to cover what the health insurance doesn’t is a stress that is very much in the present. So, I was in the mood for something cozy but kicking, something that didn’t call for a whole lot of work or special ingredients. And ideally, it would be something I could also put in Leandro’s lunch box the next day. 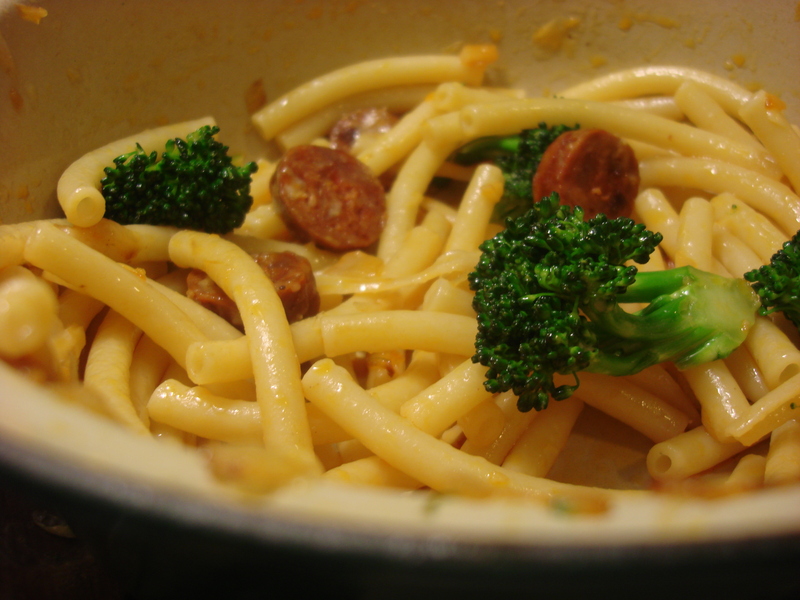 The solution — after a quick rummage in the fridge — was this invention: Broccoli and chorizo pasta with cheese. I used catanisella pasta (a new shape for me) figuring Leandro would have fun with its long, skinny, tubiness and because I wanted something that the cheese would cling to rather than clog up (think of macaroni shells scooping up clumps of cheese). The broccoli crunch balanced the creaminess and the spice of the chorizo cut through any density. All in all a great success that did the job! Boil pasta according to package directions (dipping broccoli into the boiling water to blanche). Reserve a ¼ cup of the pasta water.